Kuwaitis take pride in their intellectual freedoms and open political systems, but many liberals are increasingly worried by the growing strength of a conservative Islamist bloc in parliament. In the past month, Kuwait’s government has sponsored book banning and censorship by the Ministry of Information, the organization responsible for deciding which books are appropriate for consumption. In the past five years, 4,390 books have been banned in Kuwait. 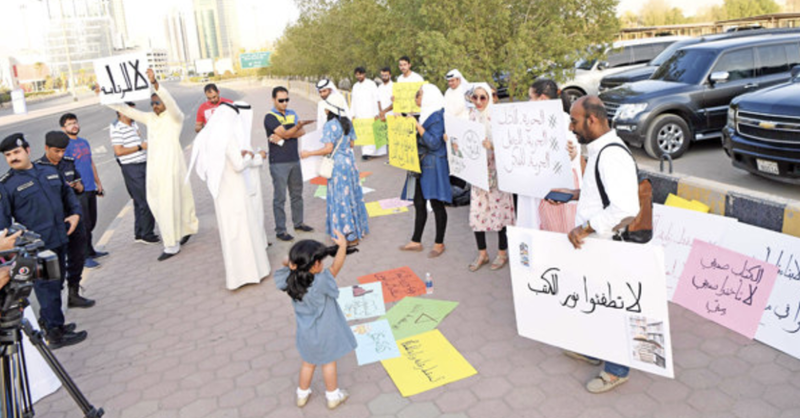 Although Mohamed Al Awash, a spokesperson of the Ministry of Information, noted that the “banned titles are a mere fraction - or around 15 percent - of the total amount of titles that have been approved in the same period,” around 80 Kuwaiti citizens protested in front of Kuwait City’s Irada Square last Sunday, revealing a fear that their freedom of expression is under attack. Fatima Matar, a professor of Law at Kuwait University and an organizer of recent protests, said that one reason why censorship has increased is because Islamists claim that the arts are “corrupting the youth and poisoning morals. Islamists [fear] that they are losing their grip on Kuwaiti society...especially with the younger generations” that are more atheist. The struggle between Islam and atheism, conservative and liberal, is not limited to book censorship. Although Kuwait’s media is, according to a 2013 Freedom House report, more critical and outspoken than others in the Middle East, a press law forbids references “deemed offensive to God, the Koran and the Muslim prophet Mohammed,” according to a BBC article. Matar has expressed a commonly held worry that book banning is merely a stepping stone to other forms of censorship. “Those who ban you from reading today won’t hesitate to block websites tomorrow, or stop you from ordering books from abroad.” But the fact that Kuwaitis are able to openly debate censorship and protest the book bannings is evidence of a political environment that can balance conservative religious influences with those seeking to protect freedom of thought and expression. Censorship is seen in American and European democracies and in small amounts is not a cause for concern in and of itself. As long as civic engagement and freedom of speech persist in Kuwait, it is unlikely that censorship and restriction of freedoms will reach alarming levels.